Conference participants using a variety of clients can chat and share links with other participants who are in the same Virtual Meeting Room or Virtual Auditorium. Supported clients include Microsoft Lync, Skype, and Skype for Business. Chat is also natively supported in Pexip's own Infinity Connect suite. 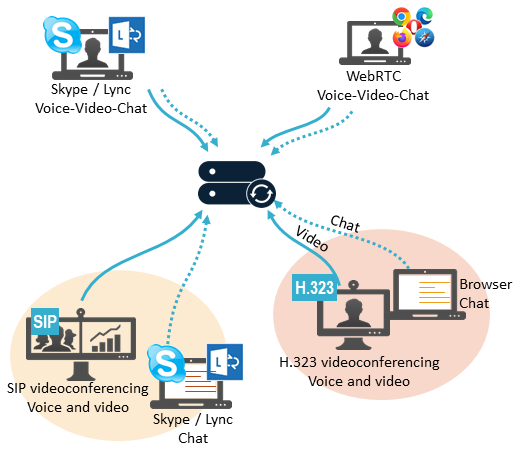 Microsoft Skype for Business / Lync and Infinity Connect clients can also chat when calling each other directly via the Pexip Distributed Gateway. Go to Platform configuration > Global settings. From within the Connectivity section, deselect or select Enable chat. Go to Service Configuration > Virtual Meeting Rooms, Service Configuration > Virtual Auditoriums or Service Configuration > Scheduled Conferences. Use global chat setting: as per the global configuration setting. Default: Use global chat setting. When chat is disabled, Infinity Connect clients do not show the chat window. Conference participants who are not using one of the supported clients will not be able to read or send chat messages. However, if they have access to a web browser they can use the Infinity Connect web app to join the conference without video or audio. This will give them access to the chat room, as well as the ability to view and share presentations, view the participant list, and (if they are Host participants) control aspects of the conference. For more information on using and administering the Infinity Connect suite of clients, see Introduction to Infinity Connect.